Halloween parties are so much easier these days for a busy gluten-free baker thanks to the Immaculate Baking Company! 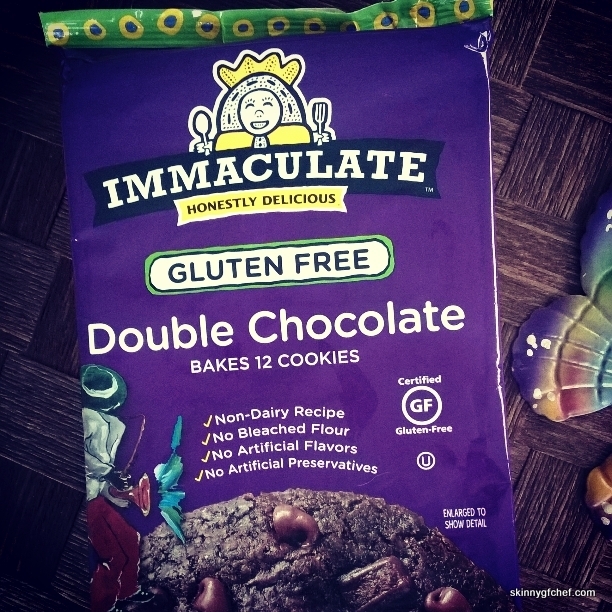 Did you know that they make Certified Gluten Free Immaculate Baking Cookie Dough? But they aren't only Gluten-Free. They make many Certified Honestly Delicious Organic mixes and doughs too! Isn't that wonderful? Here's their link to find a store near you! So, when I was asked to be an Immaculate Baking Co. Influencer I couldn't wait to give these gluten-free cookies a try. And have some fun adding my own special twist while I was at it! Grab a Coupon for any Immaculate product and save a $1.00 per package for a limited time! The pinwheels came out with Crisp rich dark chocolate edges with a soft chewy chocolate chip middle. Crazy good! Reading the story of how they started the company was inspiring. Here's an excerpt but you will want to Read the rest of the amazing story here! "Immaculate Baking quickly outgrew Scott’s garage and rapidly graduated to a huge facility in North Carolina. Over time, the brand expanded from refrigerated cookie doughs made with organic flour and sugar to include convenient canned dough products like Cinnamon Rolls, Biscuits and Scones and even many gluten-free options. Nowadays, we make a whole bunch of certified organic, gluten-free, and non-GMO products that we know you’ll love because we love ‘em too. And, after all these years, we still stick to those original values from Scott’s garage in ‘95… We celebrate creativity and soulful goodness by making honestly delicious goodies wrapped in a gallery of inspiring folk art. What’s not to love about that?" Immaculate Baking Co. has a mission giving back to the arts. That's why after the devastation in our area from Hurricane Irma I was inspired to give these wonderful cookies to my local charity. It was heartwarming to deliver 10 dozen of these easy to make healthy treats to people in need! They loved them! Ok, guys. 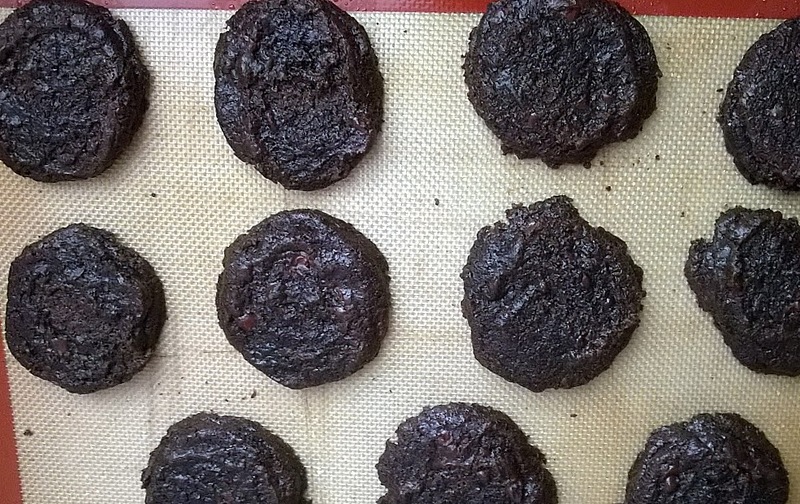 Let's make Holiday Gluten-Free cookies! These will be great on my Halloween party table! All you need are these 7 ingredients! 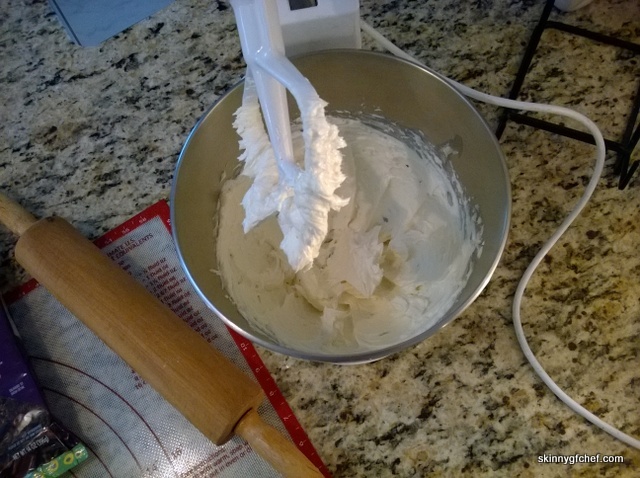 My special TWIST is adding Cream Cheese to your cookie mix! You can add it to any cookie or cake mix and the results are amazing! Just add a block of softened Cream Cheese and follow the rest of your mix's instructions. It's that easy. The result is a bit of tang that cuts the sweetness, just a little, and moist delicious cakes and cookies. You have to try it! Cream the room temp butter and cream cheese. Till it looks like this and then add one egg, combine and add the vanilla, food coloring and cookie mix. It is orange, not pink, I promise! 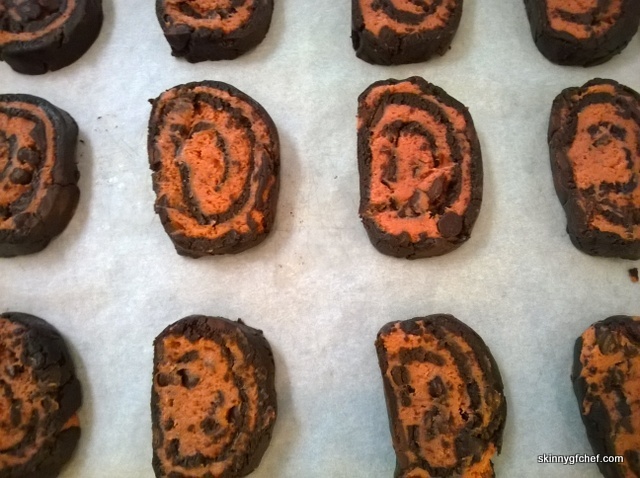 Now, chill the orange dough while you roll out the Double Chocolate. Be sure to have parchment under and over while rolling! 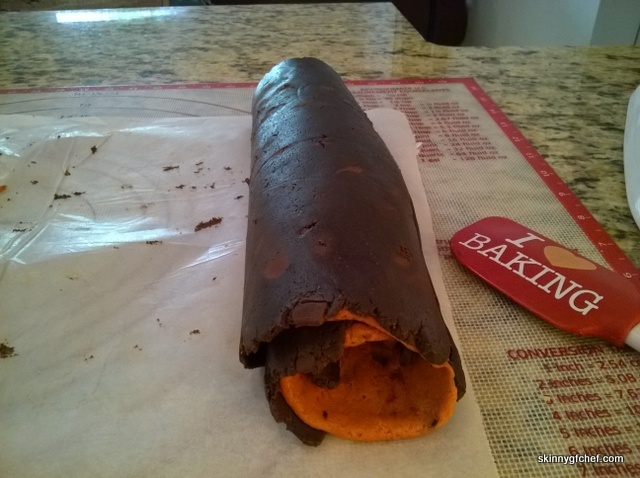 Roll out 1/2 of the Orange dough and lay it on the Double Chocolate. You can freeze the remainder or use for your next batch! Roll from the small end tightly, using the parchment to help as you go. Makes- 2 dozen, depending on how big you cut them. Optional- McCormick Red and Yellow Food Color to desired Halloween color, I used 1/4 teaspoon red and 30 drops yellow. 1. 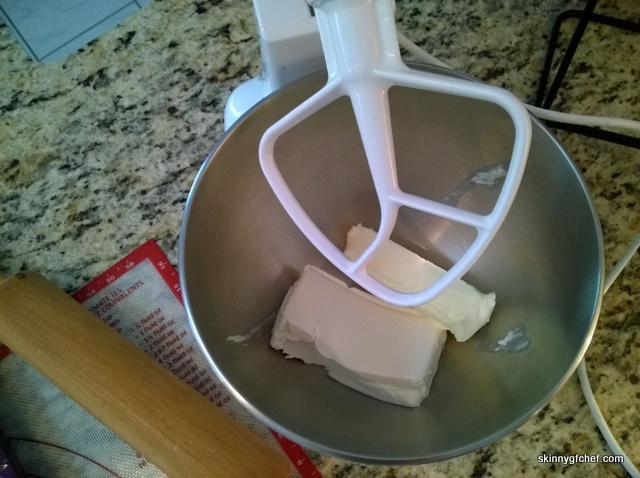 In the large bowl of your stand mixer -Cream together the softened butter and cream cheese. 2. Stir in egg and vanilla and food coloring, if using, until soft dough forms. Divide in half and chill. 3. 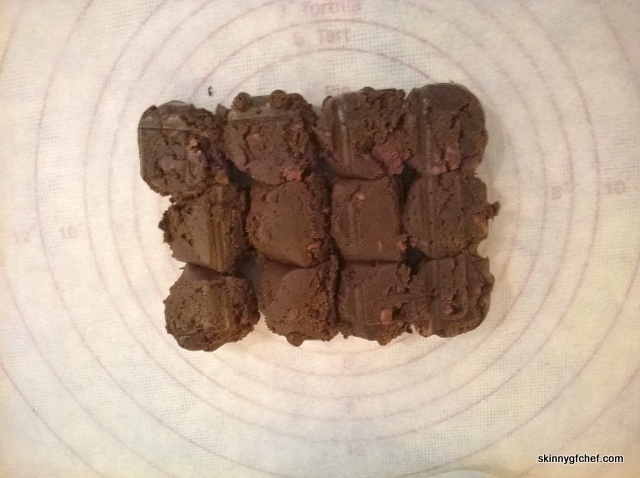 Roll out the Double Chocolate dough to a 10x15 inch rectangle between two sheets of parchment paper. 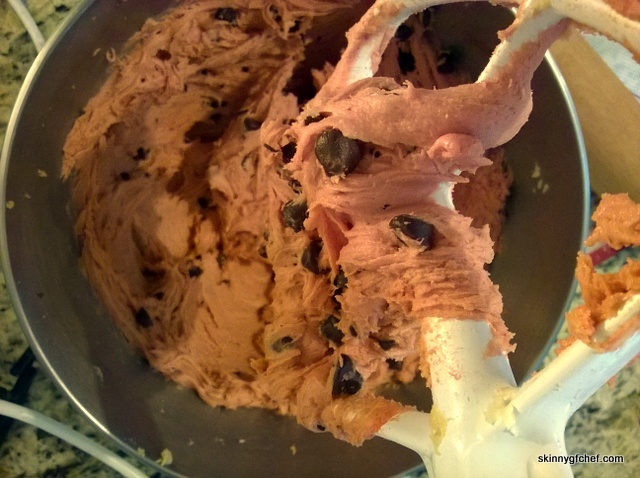 Set aside and roll out 1/2 of the Chocolate Chip Cookie mix to the same size. Lay the Chocolate Chip cookie mix on top of the Double Chocolate layer. 4. Roll from the small end tightly, using the parchment to help as you go. 5. Chill the log for 1 hour or more. The longer it's chilled, the easier it is to cut. Use a large sharp knife to cut. 6. Slice cookies into 3/16" rounds. 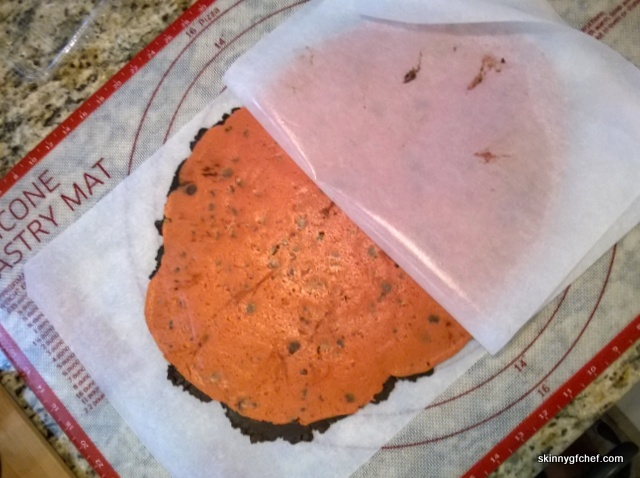 Place cookies 2 inches apart onto parchment-lined baking sheet. 7. Bake 15-18 minutes or until just firm to the touch. 8. Cool completely; store in airtight container. Do you have a last minute party and need to make Gluten-Free Cookies fast? 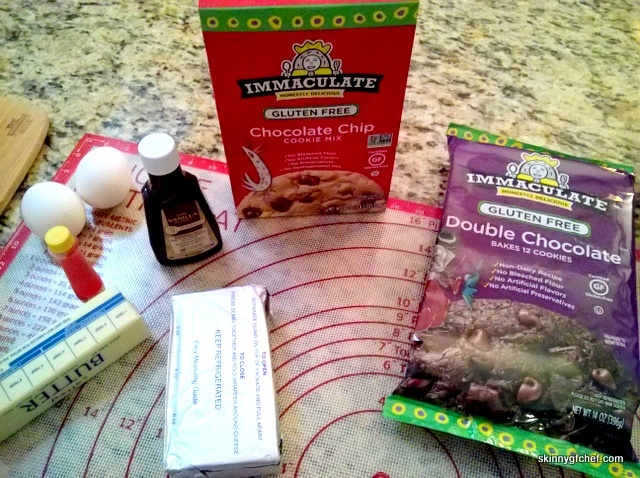 Immaculate Baking Cookie Dough is incredibly handy to pull out and bake up at the last minute! And the finished cookies are delicious! Add any extra's you want to this beautiful dough but I have to say, my favorite is cranberries and chocolate...yum! And they are perfect for the holidays! Don't Forget! Get your high-value coupon for a limited time here! Two eggs in my pictures but I decided to just use one in the recipe! Making pinwheels was a great idea. You make it look easy. These look so yummy. I am thinking cookie exchange baking now. What a great looking cookies! My son has glutten free diet. Thank you for sharing. I am sure he will like it. They may be gluten free but these cookies look super rich. We don't eat gluten free in our house, but that doesn't mean we can't try it out. who doesn't love cookies? i haven't baked much GF, but i would love to try these out, they look really good. These cookies sound so good. I love that they are GF, so everyone can enjoy them! I just made some gluten free cookies the other day and couldn't believe how good they were. I will have to pin this for later. Gluten-free for the win! These look awesome, I am majorly impressed with the swirl look! Hey, GiGi! It's so great to see you! Thanks, my swirl suffered some from spreading but holy cow, these cookies are so good. Big hugs! I always thought gluten free food was boring but you and Immaculate Bakers have proven me wrong. I would love to make my first gluten free cookie! Oh my goodness these look amazing! I never knew gluten free could be so delicious! 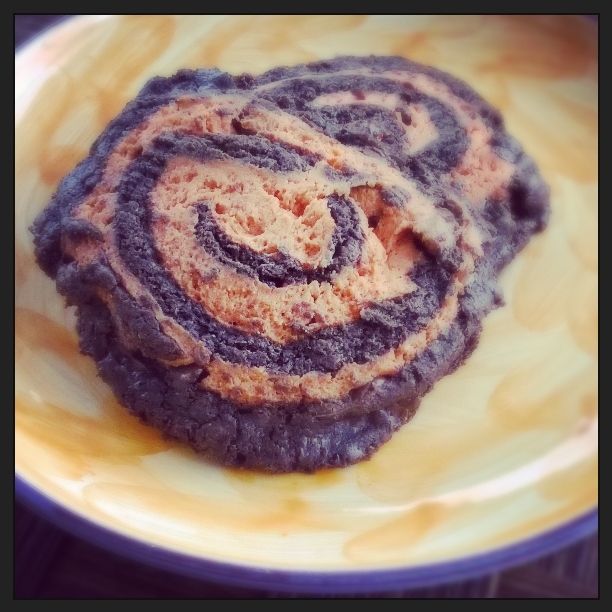 I'm not gluten-free in general, but I still have to try this recipe! I really like for festive they are for Halloween! Oh yum, this looks so delicious! I haven't tried this brand before--I'll have to very soon because it sounds tasty. The look so interesting and good! I never had such cookies! I defo want to try this recipe out! I am definitely going to try this! My family tries to eat gluten free as much as possible, since we have witnessed first hand how much better we feel overall when we eat gluten free recipes. I always look for NON GMO and Gluten Free snacks too. And so nice of you to give back to your local charity. Oh now I need to try these, I love that they are gluten free and they look absolutely delicious - oh to tuck in right now! Wow these look sooooo good! So neat they are also gluten free WIN WIN! Gluten free cookies?! YES PLEASE. But even more fun was enjoying the eye-candy of the ingredients images. Now am salaivating and ready to bake! My daughter's friend is dairy & gluten free. I try to make sure she can enjoy all the fun when she comes over for playdates or parties. Need to stock up on Immaculate Baking products, so I can make things like these cookies. Oh how awesome!! I love that so many recipes are able to be gluten free and taste great! Such a fun recipe!! Those cookies looks amazing. I have to make them! I'm trying to eat gluten free as well. They look so yummy! I like it because it's organic and gluten free. Thanks for the recipe. These look delicious! Making cookies is one of my favorite holiday traditions. I love that you took the opportunity to give back to your community. We where hit pretty bad by Irma here in SW Florida and I loved to see how our community pulled together. I am a make it from scratch type of cook but I can see the advantages of ready made dough. I bet it tastes great too. the pinwheels looks so seasonally appropriate! the cookies are gorgeous... this inspires me to make cookies! Oh boy do those look rich. Cream cheese is a seriously nice touch. So clever! And I love a product with a cause. I also love it when gluten-free products actually taste good. Because let's face it, if you've eaten gluten-free for any amount of time, you've likely had some products that are the opposite of delicious. Thanks for sharing these! 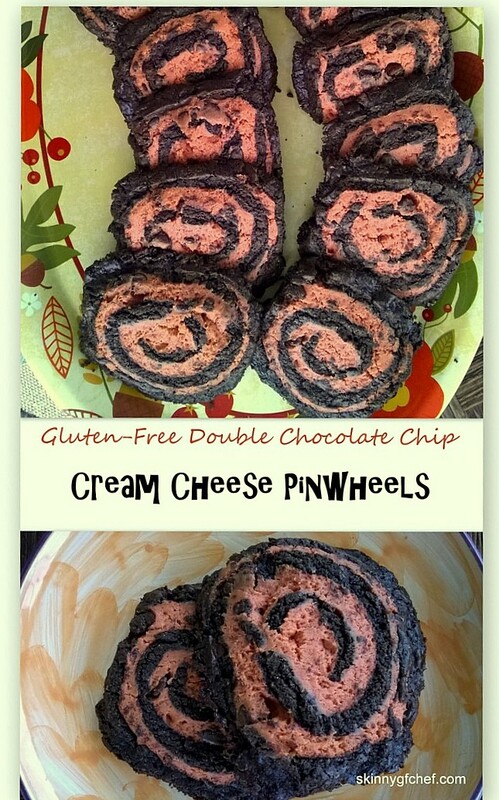 Cream cheese pinwheels look delicious. I am not much into baking at the moment, but this recipe make me wanna try! Omg these cookies look absolutely delicious! Love the ingredients you choose for this recipe! Checking the pics makes me drool over it but the idea to help the people as a way of giving back or paying it forward makes my heart melt. Cheers to you and your success. I have seen these cookies in the store and have not bought them yet. They look delicious and it looks like something I am missing out on. My friend Allison can only eat gluten free sweets and she loves to bake sharing your post with her. I have never tried gluten-free anything and I would love to try these! Omg these cookies look absolutely delicious!!!! I will definitely be giving your recipe a try! Yum! These do look delicious. I know that my daughter would have loved this while she was on her gluten free diet. I will have to remember this should I need to do this in the future. Gluten free cookies are always a healthier option.These looks delicious.And it seems easy to make these with easy steps. These cookies are amazing and I should definitely make them with my kids! I'm sure they will love them!